Ethiopian feast from Ras Dashen. As is clear from even the most cursory look at the CTS archives, we much prefer hitting the road and eating out to eating in, cooking or having food delivered. We have such a mind-boggling treasury of great food within short journey confines, the food is ALWAYS better straight from kitchen to table – and we get, often, to meet the people who make it. Before the advent of Uber and the somewhat earlier whizz-bang delivery apps, we did sometimes indulge in home delivery. Pizzas from Motorino, for instance. But truth be told, though pizzas seem to have been pretty much a foundation food when it comes to home-delivered food, we found the process really did affect the quality. But now there’s Uber – and like many people we know, we are occasionally using it. What is the attraction, over and beyond the other delivery apps? The app, of course, is very slick and the photos gorgeous. But most important, I think, is the geographically restricted catchment for any given address. Obviously, this diminishes Uber for some who lack coverage. But for us and many others, we must choose relatively local – and that’s a fine thing. Obviously, there are broader issues involved with Uber and the like. But on a micro, more local level, it works. We even have a good CTS pal who drives/delivers for them who has suggested I do likewise. 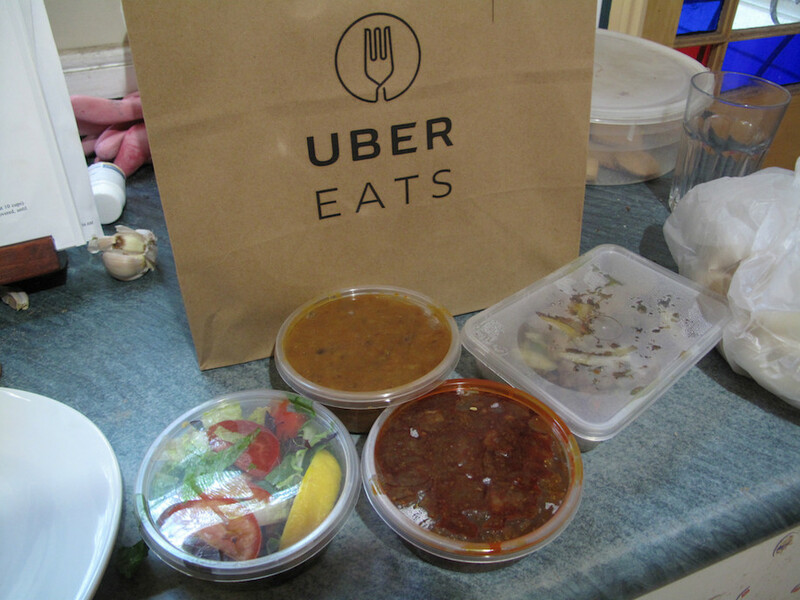 As is well known, Uber takes a fair old whack from the eateries, but as the above linked story also illustrates there are advantages for them – most importantly, perhaps, the non-necessity to hire drivers themselves. And often, customers demand it. We have worked at finding what works for us – what is affordable, what we actually want to eat, what mirrors as closely as possible a restaurant experience once the food is plated. For starters, we just won’t be doing fish and chips (despite some happy experiences with Dough! in Newport) or hamburgers. Just not good travel potential going on there. And we’ve found, in terms of Indian food, the likes of dosas and pooris are soggy dead losses. By contrast, we’ve found biryanis to be a winner. We’ve had chicken biryani from Sankranti, Dosa Corner and Spicy Chef – and they’ve all been good and affordable. We’ve had some fine Vietnamese from Phu Vinh in Footscray. The broken rice with pork chop, shredded pork, fried egg, meatloaf and pickles was truly spectacular. But THE best we’ve found is Ethiopian. So far, only two Ethiopian eateries service our area – Ras Dashen and Abesha. We’ve ordered beyaynetu veg combos from both and enjoyed them, a key being that the injera is already moist and kinda soggy so the delivery process simply can’t do bad. But in each case, the lentils (two kinds) and the familiar Ethiopian veg of carrots, spuds and beetroot have been delivered in the same container. This is no biggie, really, as the dishes soon merge served on a platter. 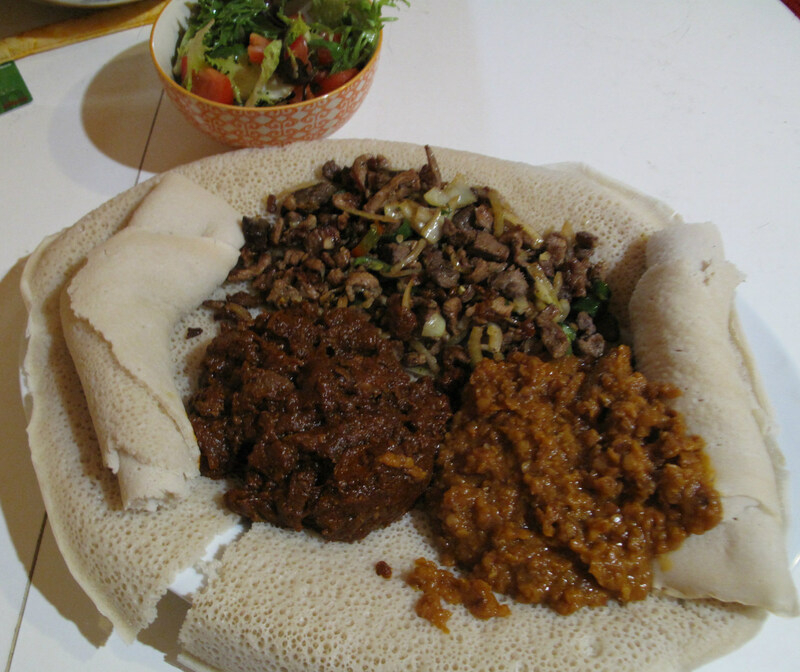 However, last night I twigged that, with Ras Dashen at least, there is another way – the meat mains can be customised. So for our Tuesday night dinner we had lamb tibs well done ($13), one extra piece of injera ($1), a small serve of both lentils ($3 – bargain!) and khey whot (spicy beef stew, $6) and side salad ($3.50). Initially, we thought we may have over-ordered and not got enough injera. What a magnificent feast it was! And at $31.50 (including $5 delivery), very little different from what we would’ve paid had we got in the car! 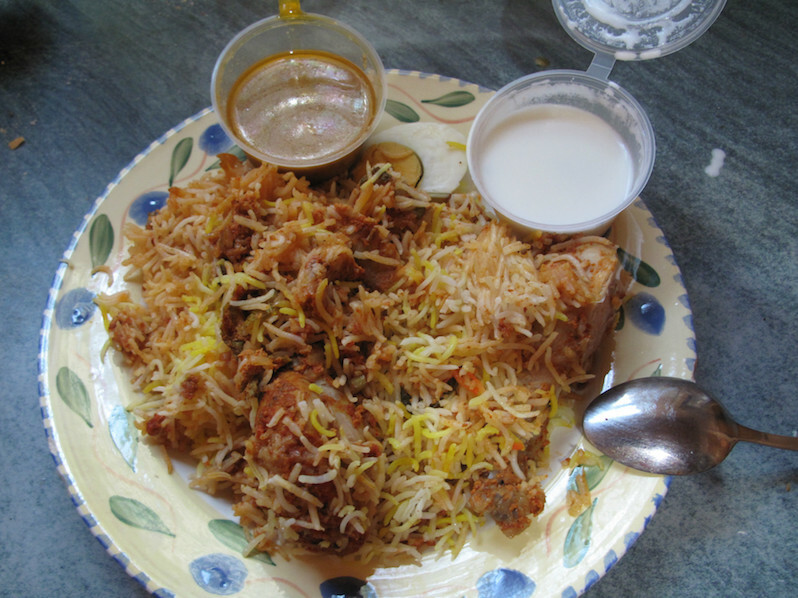 Chicken biryani from Spicy Chef. ← Sushi train? No! It’s hot pot train!